A few days ago, we received this way cool box from Whole Foods Market. How did they know what to give us for Chanukah? Boxes are just the best! Maxie, seriouslies. It's what was in the box that was way cool. Well okay, and the box was pretty chill, too. Speaking of which, it's my turn to play in it. 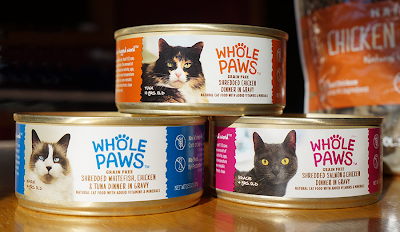 Cool boxes aside, it would appear there's a lot to like about the new Whole Paws® line of dog and cat food. They offer dry and wet foods, both of which are manufactured in the USA. We don't have to tell you how dangerous non-North American sourced meats can be. We've written more than one post on warnings by the FDA about the dangers posed by treats and foods made in China. Whole Foods also informs us that all products are tested by a combination of in-house and third party laboratories. Did you know that, in this, they are ahead of the curve? Just a few weeks ago, the FDA issued a proposed rule aimed at improving the safety of our pets' food. It's currently in the middle of a 120-day open period where public comments are welcomed, and you can read all about it (even voice your own opinions) at this link here. 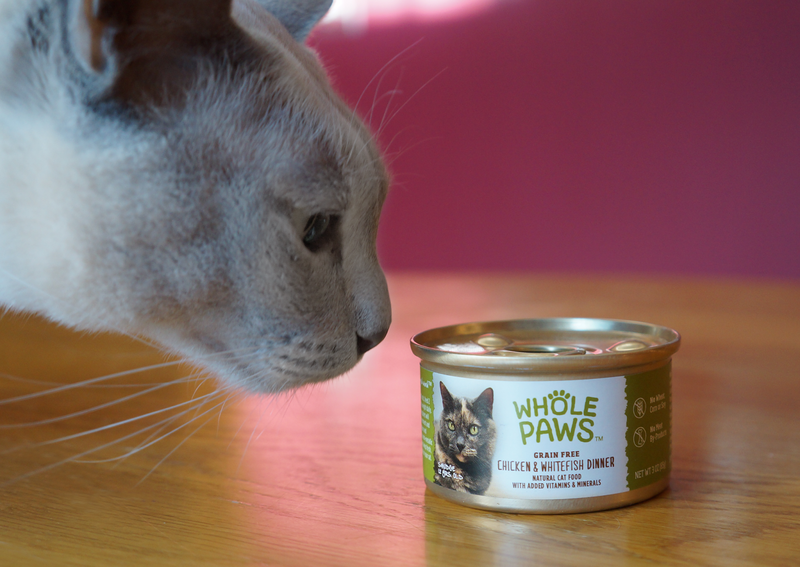 Whole Foods has stated they insist Whole Paws® meet their strict quality standards. If you wish to learn more about their quality standards, you can read about them here. 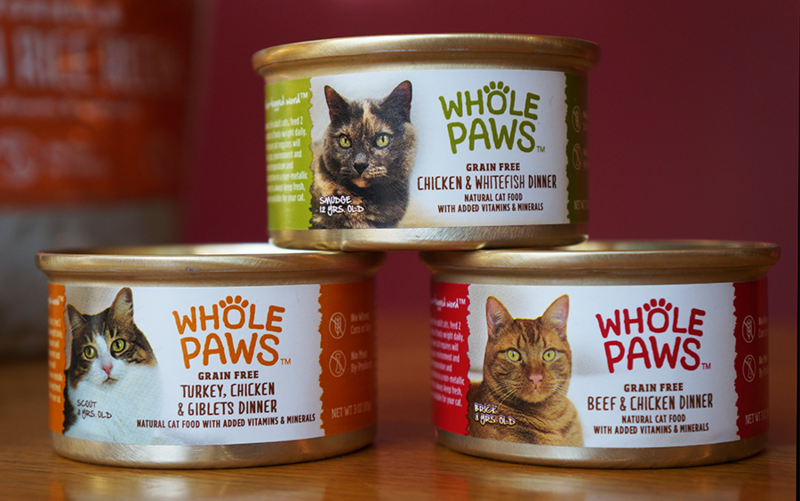 Though they have yet to publish a standard specific to pet food on this page, you can still get a good feel for where the company stands on quality issues at their site. Their ingredients description states that all Whole Paws® foods are made with real chicken, salmon and other wholesome, nutrient-rich ingredients. They contain NO corn or soy, NO animal by-products, NO artificial colors, NO artificial preservatives and NO added sugar. Why is it important that the food you feed your pets does not have these ingredients? I want to briefly touch on just two of these. Soy is used by some pet food companies as a cheap way to increase the protein content in their pet foods. It also increases the bulk of the food, which means they have better profit margins. 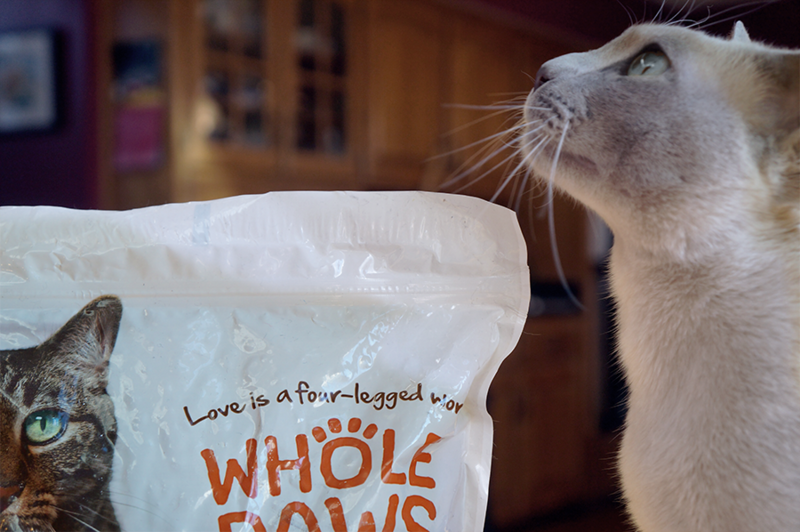 The fact WholePaws® is soy-free is VERY GOOD. Faraday: " Soy free. Thank you, Whole Foods!" If you've been reading our blog for a while, you may recall our Blog The Change article on Pet Food, Recalls and Radiation. In it, we relate a story told to us firsthand about the questionable sources that some pet food companies use to acquire animal by-products. Believe us when we say you do not want to feed this to your pet. Again, the fact WholePaws® is by-product-free is GOOD. We're intrigued. And we can't wait to try it out. 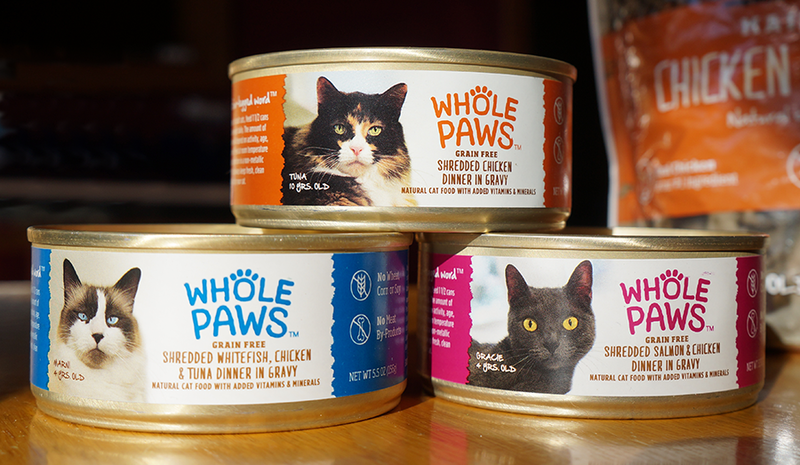 Whole Foods Market sent us dry kibble, canned and grain-free canned. We personally prefer grain-free, and do not like to feed dry because of its low moisture content. 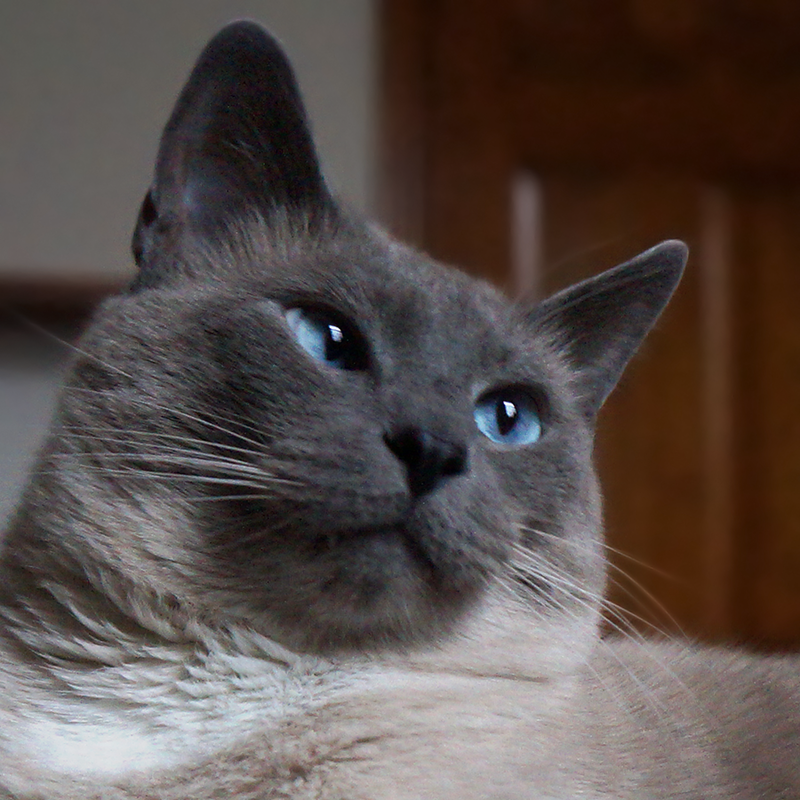 And we've been on a two-year-long quest to find a canned food for our lone holdout, Maxwell. Will WholePaws® be the brand that finally weans him away from dry food? We hope so - and can't wait to find out! Come back December 27 when we post our review to see Maxwell's progress. Oh...and Allie approves this message. And the WholePaws® slogan: "Love is a four-legged word". Now we did not know that about soy. Great post, Lisa! I especially like all the links to more info from your past posts (since I don't get around to visiting as much as I like). Your photos are great and the post is both fun AND informative! not to mention the cat lacks the digestive enzymes to properly break down the soy and get the protein out of it.. so it is like saying here, have 1,000,000$ but it is in this strong box you don't have the combination to..
and then there is the fact that most soy in the US is GMO..
Wonder if we can find this product in Canada. Right now my gang is on Innova Evo wet and dry but Levon is a hold out for wet food too..so maybe this product would entice him! This food sounds so good I may write about it tomorrow. MOL! 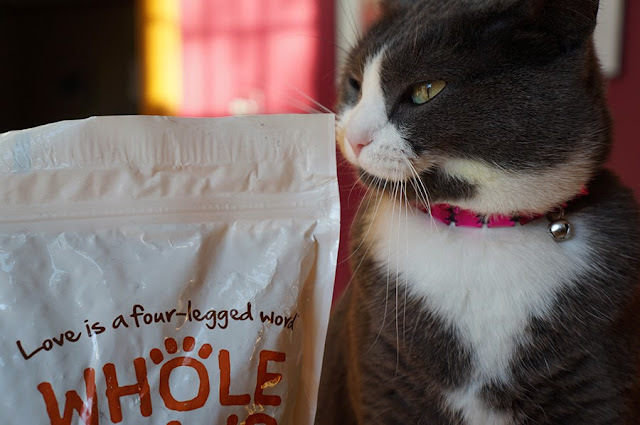 We may need to check this stuff out--that is, if you think black cats will like it too. Thanks for the recommendations! A very thorough review! I'm anti-soy across the board, so I was glad to see it's not in this food. There are a ton of other things (corn and color) that aren't included in the dog food, which I'm super happy about because my pup Cooper has the most horrific allergies and a sensitive digestive system. I think this brand might be a good fit for him! Paws up! Binga is kind of annoyed she has to wait to try out the package we got! I'm debating whether to include her scandalous behavior on my Saturday post. That sounds like great food. We have never heard of it before but it sounds great. Thanks for this great review. Good job. Take care. We have a Whole Foods nearby and are curious to see whether you guys like this food. I wish I knew if Katie would eat it. I am getting desperate. @LP, @Kitties Blue, @Whisppy - what is it with stubborn felines who won't eat what's good for them? @Maggie, us too! (Uh, I guess our post kinda gave that away) We're VERY anti-soy. @Madi - *madly waves paw* HIYA new BFFFF! We aren't as good at visiting as some people who have DECENT humans who don't use W-O-R-K as an excuse all the time, but we promise to hold her feet to the fire, MOL! @Katie @Sometimes - we can't wait to try it out!!! We need to find a Whole Foods Market so we can get some of that food! Hi Guys and Allie, First--we apologize for being so scarce ::glares at Human:: So, she might buy me a can of that stuff. She keeps trying to buy high-quality canned food and I keep refusing to eat it and demanding my cheapie junk fudz. Or, better, I will eat a can of Halo or some other classy brand and she'll be all "SQUEEEEE" and run out and buy 10 cans and I'll never touch it again. Heh heh--I *LOVE* to do that. So yeah, she'll prolly give that WF stuff a try. We'll let you know! That was quite interesting and yummy sounding too! We didn't know that about soy either! We'll be waiting with bated (smelly) breath for Max's review. That sounds really jummy and healthy !